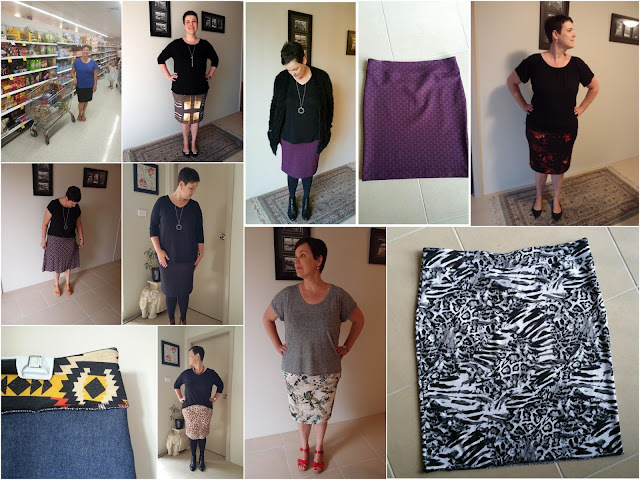 I've made myself quite a few Mabel Skirts and I really love the shape of them, and how easily they fit in to my wardrobe. That said, I don't love the waistband, and probably half of the Mabel's I've made have ended up in the charity pile as the waistband has ended up too big. The pattern has a simple waistband that you sew to the skirt, but with no elastic involved my first ever Mabel was just too big in the waist. To counteract this, I would sew some clear elastic between the waistband and waistband facing and sometimes this would really work well, and other times my waistband would still be stretched out and too big. I really have NO idea why sometimes it worked and sometimes it didn't...that's sewing for you. But when I fluffed my beautiful butterfly ponti I was ready to put the Mabel away for good - which is a problem as I still have quite a bit of fabric in the stash for this very skirt. After sewing a few Lady Skater Skirts and attaching a 5cm wide elastic waistband my love of the wide elastic waistband grew. Why couldn't I do this for my Mabel Skirts -- after all I have a few RTW ponti pencil skirts just like this. It's only taken 2 years, but my brain finally got there in the end! In order to change the pattern piece I just added 10cm to the top to account for the 5cm elastic and 5cm to turn it over and then stitch it down. In hindsight, and now that I think about it it probably needs a bit more added as turning the fabric over would take maybe 1cm so the skirt is a smidge shorter than I would like. To make this new "waistband" I sewed a loop of 5cm elastic tight enough to fit my waist, but not so tight that it would be painful. I've found that different types of elastic will make the loop bigger...or smaller I like "soft elastic". Then I just overlocked it to the inside of the waist, turned it over and stitched it down with a zigzag to keep it from flipping over. And the verdict? I wore this skirt to work yesterday after finishing it the night before (it took an hour to cut out and sew). It was VERY comfortable - much more comfortable than my "clear elastic waistband sandwich method". In fact I also wore it again today for a 2 hour car trip up to Newcastle and it was pretty comfortable to sit in. My only change for next time will be to add a bit of length to it. As it is it sits just above my knees, and I prefer this type of skirt to sit on the middle of my knees. 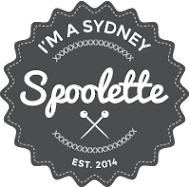 The fabric was bought from my local fabric store - My Hung in Parramatta. They stock a lot of woven fabrics and stretchy "dance stuff" so I often walk out of there empty handed. I feel in love with this fabric though - I do love the pattern on this fabric and it only set me back $6.50/pm. It's probably not the best fabric for a hot summers day - it's 100% Polyamide (whatever that is) and feels like (fake) wool on my skin, but I'm willing to suffer for my sewing (and something that goes so well with my clogs). I'm going to call this a WIN and I finally feel confident enough to cut my really nice piece of ponti from Tessuti that I've been hoarding in case my Mabel waistband went belly up. I'm also now going to remake my butterfly skirt with some "back up" fabric in the stash, and I've even ordered some "denim look" Ponti from the USA to make myself a much longed for denim Mabel. Size: XL, sewn with 3/8" seam allowance and lengthened by 15cm. 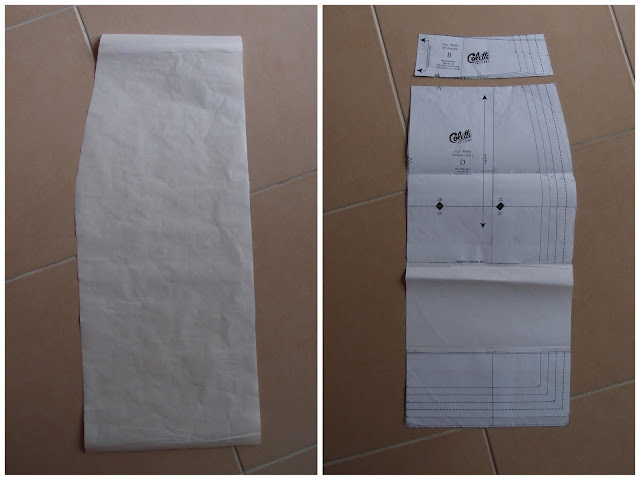 Modifications: 5cm elastic waistband (added 10cm to the pattern to accommodate for this), 15cm added to length.